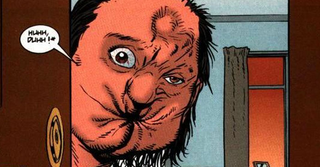 One of the more anticpated main characters of AMC’s upcoming show Preacher is Arseface, the son of an abusive sheriff who had survived a suicide attempt, resulting in his horrific appearance. Now, Seth Rogan has shared what the character looks like on Twitter. Preacher will debut on AMC on May 22nd at 10/9c.